Ultimate Ears Cardboard Box Packaging Gunmetal Blue In-ear earphones metallic travel case 1/4" adapter jack attenuator cleaning tool kit kit Extender Cable Housed within the universal body are three individual speakers and an integrated passive crossover circuit board that directs the low-end frequencies to a dedicated speaker for bass the mid-range frequencies to a speaker for the vocals and the high frequencies to a speaker dedicated for treble. I bought these earphones not knowing what to expect, once you find the right earpiece, that isolates the sound your in for a pleasant surprise. Bass is really rich and full, mid sounds warm and highs are outstanding...I would recommend these earphones to anyone looking for a good set of headphones. 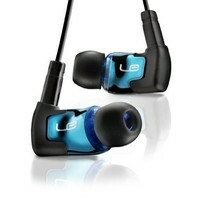 Their is only one bad thing about these headphones, the actual earphone is quite big... I luckily have big ear canals, but someone who has small ear canals,might find these headphones to be somewhat uncomfortable ... I hope my review helps someone looking for some budget earphones... I paid $110 from some guy on CL good luck!